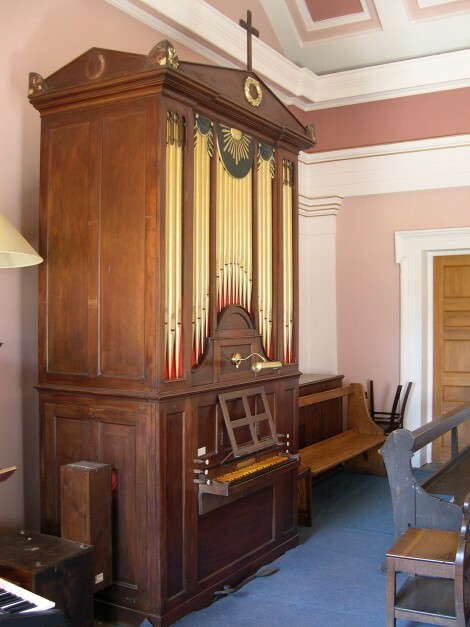 The organ was made for Hassop Hall, the home of the Roman Catholic Eyre family, perhaps in 1816, and moved to the new church in around 1828. It was made by Henry Cephas Lincoln (“Organ Builder to His Royal Highness the Prince of Wales”), and is a fine example by an excellent organbuilder. It had suffered a bit in recent years, partly at the hands of an incompetent organbuilder. Repairs were carried out by Martin Goetze, Edward Bennett and Dominic Gwynn in 1987. A shifting movement removes Principal, Fifteenth and mixtures. The key compass is GG AA to f³. The pitch is A425, with some of the pipes still cut to length, some tuned with slides. The tuning was left as equal temperament, to disturb the pipework as little as possible.